I originally wrote these instructions as part of an article about using “test swatches” of tile glued to pieces of plywood to see what different grout colors would look like with all the tile colors of a particular mosaic. Mosaic Coffee Table by artist Megan Adams with white grout “bleaching out” the intensity of the tile colors. Notice how the grouted mosaic above is less intense in color than the ungrouted mosaic . 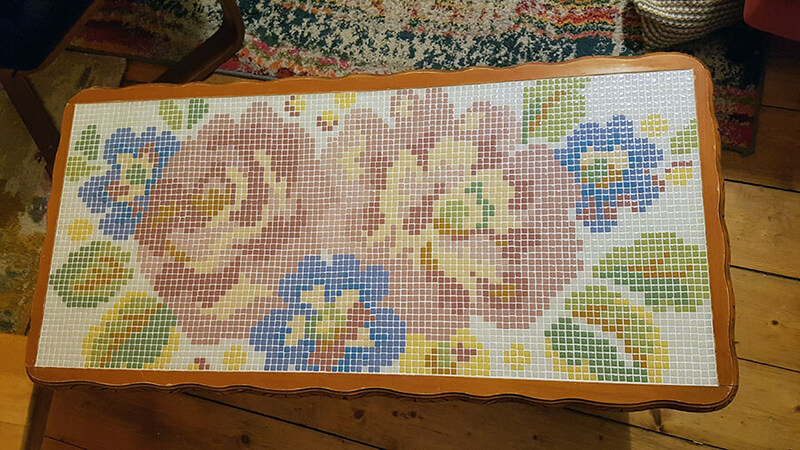 Mosaic Coffee Table by artist Megan Adams with stained grout. 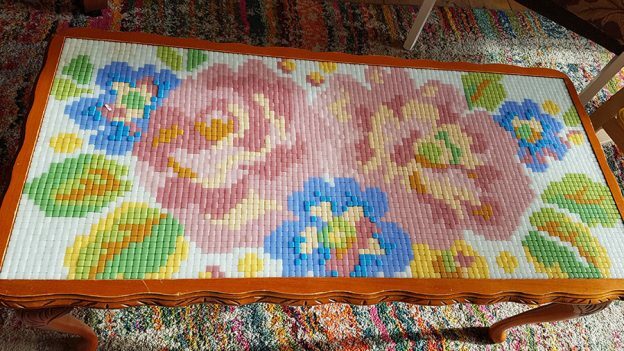 If you want to change the color of a grout line in a finished indoor art mosaic, you can do that with artist’s acrylic paint applied via wipe-on-wipe-off using a rag. You get it applied and wiped off quickly before the paint can dry on the glass. The paint sticks in the porous grout so that it doesn’t wipe off. I recommend diluting the paint with acrylic media to make a water-based “grout stain.” You can also apply undiluted paint for a more opaque covering of the existing color, which might be simpler for most people. I recommend experimenting on any piece of scrap material to figure out colors and dilutions. I recommend testing on a grouted tile swatch before applying to the mosaic to see how it actually looks on the grout. I recommend Yellow Ochre and Burnt Umber. Both are UV resistant mineral pigments and considered non-toxic. They also make great stains. You can also use Ivory Black and Titanium White to make hue-neutral grays of every shade, but a wide range of colors are available, and you can make more interesting grays too. I would avoid toxic Cadmium Yellows but Nickel Yellows are considered safe. I would avoid making my grout paint more intense in color than the tile colors. Please explain what you mean by “acrylic media”. Also, for the colors you refer to such as Ivory Black and Titanium White – what brand of acrylic paint are they? Acrylic medium is the clear acrylic that artists mix with acrylic paint to make glazes. Ivory black and titanium white are pigment names used by all the major brands of acrylic paint. Thanks! Great advice. I recently used glass paint on a stained glass mosaic portrait as one piece was too white and popped when it was supposed to be a highlight. I mixed a light gray and painted the one piece. Made a huge difference. Many years ago I needed a specific blue grout color for a commission. I had a WATER BASED wood stain (white base) tinted at Home Depot the exact color I needed. Now I keep a can on hand and pour out what ever I need and tint it with Tints-All. I have only used this method on sanded grout. As soon as the grout takes it in be sure to wipe the surface with a damp sponge or cloth to avoid dulling your tiles or glass. As always test first! 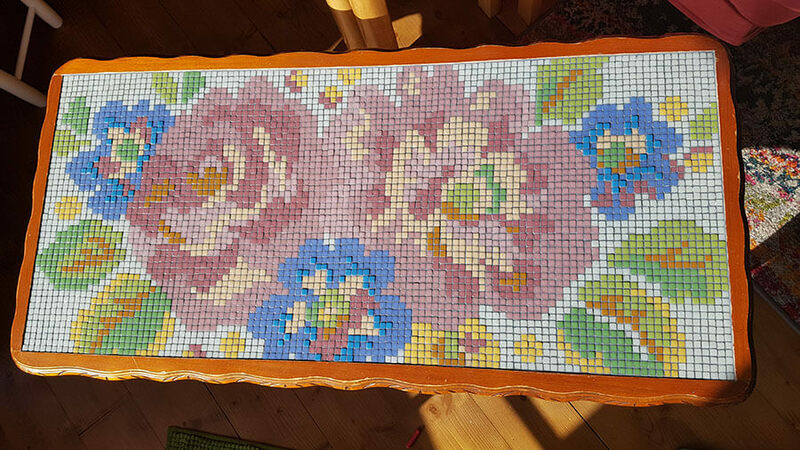 I have used this method on a number of mosaics to avoid the “summer camp project” look–a perfect name, by the way. 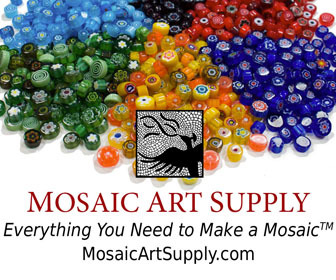 It is much easier than trying to tape off segments of the mosaic to grout different areas with different colors of grout, and much more accurate. As you can see above, it makes a tremendous difference in the final appearance of the mosaics. They look much more like the classic ancient Roman mosaics which did not use grout at all. With a mosaic using grainy vitreous tiles, is there a danger of the paint staining the tiles because of the pores? I am not a big risk-taker with grout and, like Joe, I practically always use a dark charcoal grout color. I advise my students to avoid white, but I provide it and sometimes I have been surprised. With solid, bright color tiles, white grout can make the colors pop just like the dark grout does. However white grout tends to fracture a design rather than bring it together like dark grout does. If it is abstract – especially with small grout lines – it can work. Alway best to do a test sample, of course. I am most often disappointed by medium gray grout, which seems to dull everything.